If your family is like most, grocery shopping is a dreaded weekly task. Typical shoppers usually have an idea of what they plan to purchase based on a previously made shopping list. Even then, it’s easy to go astray with impulse purchasing, bargain prices, and buy-one-get-one free opportunities that simply can’t be passed up! Before you know it, the shopping cart is loaded with delicious treasures just begging to come home with you. Now that you have done the shopping, transported it home, and begun to put food items in their appropriate storage places, you realize the refrigerator, freezer, and pantry are cramped and nearly full. On a related aside, you should see my parents’ pantry. They have enough cans, boxes, and packages to feed their entire neighborhood…twice! Not to mention the two full size refrigerator/freezers that are bursting at the seams. Like my parents, I suspect many of us have a food overbuying addiction. So what happens next? Well, it’s time to clear out the old and make way for the new, of course. But how do you know what to purge and what is still good to keep? Standard or uniform language for food product dating does not exist in the U.S., which makes things tricky when it comes to deciphering expiration dates. 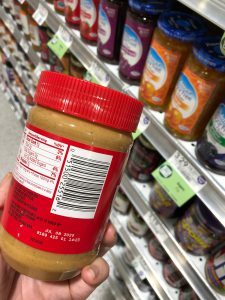 Current Federal regulations do not require product dating (excluding infant formula), but instead allow food manufacturers to voluntarily set and display these dates on product packaging. With the lack of Federal measures, product dating enforcement is left up to individual states, resulting in consumer confusion over food safety. The U.S. wastes close to an estimated 40% of food produced annually, which equals approximately 160 billion pounds (Harvard Food Law and Policy Clinic). Of that, confusion over the meaning of date labels seems to be responsible for roughly 20% of safe and edible food wasted by consumers. Undoubtedly, this hurts purchaser’s pocketbooks and results in $29,000,000,000 of wasted consumer spending yearly (Food Date Labeling Act of 2016, 114th Congress 2D Session). While cleaning out the pantry and cold storage, I also have been guilty of trashing perfectly good food. So many of us unknowingly accept the stamped date as common law not to be questioned. So what does that date actually mean? The “open” date used by the manufacturer or retailer on food packaging is passively thought of by the consumer as the “expiration date,” or the last date a food can safely be eaten. This is a very common misconception. Food safety is not represented by this date, but rather it refers to product quality and freshness. Dates determined by food companies take into consideration such factors as ingredients, product characteristics and packaging, as well as time and temperatures associated with distribution, retail sale, and storage. “Best If Used By/Before” indicates when a product will be of best flavor or quality. “Sell-By” indicates to the retailer when the product should no longer be displayed for sale. “Use-By” is the last date recommended for use of the product at peak quality. This is only a safety date when used on infant formula packaging. It’s important to remember that open dates on food products ONLY reflect food quality and NOT food safety (except for infant formula). For a list of specific foods and recommended storage time frames, check out the FoodKeeper resource at FoodSafety.gov. Knowing the signs of spoilage will help you determine if a food is no longer fit for consumption. Although the quality date may have passed, the food is safe until it begins to spoil. Spoiled food may have a different smell, taste, and/or texture with sometimes visible discoloration. This occurs when environmental conditions (such as temperature, moisture, and oxygen) are introduced which support the growth of bacteria, molds, or yeasts. Given enough time, these microorganisms multiply rapidly and affect the safety of the food. If perishable items are not handled and stored properly, spoilage occurs much more rapidly. Learn more about proper refrigeration and food safety. Plan meals in advance and make a specific grocery list. Check the refrigerator, freezer, and pantry to utilize what you already have on hand. Don’t overbuy! Especially be aware not to purchase excess perishable items that are likely to spoil quickly. These may be foods that require cold storage, fresh bakery items, and fresh produce. Always look for and compare date labels of an item; choose the one with a later date. Store foods promptly and properly for food safety and best quality. Discard potentially hazardous cold food items that have not been properly refrigerated for 2 hours or more. Keep a thermometer inside the front of your refrigerator and check it regularly to be sure it stays below 40 degrees F.
Thaw foods safely! Thawing in the refrigerator is the safest way, but using cold running water or defrosting in the microwave are acceptable ways to speed up the process. Never sit foods out at room temperature to thaw! Recognize the signs of food spoilage and promptly discard foods that smell funny, have off-flavors, obvious mold growth, or sticky or slimy textures (such as fish, poultry, and deli meats). Evaluate each item in your pantry and consider whether or not it’s something you want to continue to store and use or want to remove. High temperatures affect the shelf life of shelf-stable foods so it’s important to store dry goods and pantry items in temperatures at or below 85 degrees F. Use the “First In First Out” (FIFO) method of rotation, using older items before newly purchased ones. Read more about Shelf Stable Food Safety. Discard cans that are rusty, bulging, or leaking, as they are at a high risk for containing the deadly pathogen that causes Botulism. Never taste suspicious foods! Take extra caution by disposing of cans and jars into a tightly closed plastic bag before placing in an outside trash receptacle. Mistakenly discarded food products, not only is the U.S. but globally, have created a sad cascade of wasted resources and money with increasingly negative environmental and social implications. Food banks and local community organizations have plenty of under-served and needy families who can benefit! Remember, it’s safe to donate dry and canned goods, perishables, and other food related items that are beyond the quality date of the product. Find a food bank near you. We all can do our part to reduce the amount of wasted food, save money, help the environment, and help our communities! Amy Mullins is a Family and Consumer Sciences Agent in Leon County, with programs focused on food & nutrition, food safety, health & wellness, and chronic disease prevention.Amy is a Registered Dietitian and a graduate of The University of Florida and Florida State University.